The FDA has opened a Mexico City office, part of the agency’s plan to re-design its product safety strategy by working with regulatory partners. The new post marks the agency’s 10th international post and its third post in Latin America in 13 months. The Mexico City office will work alongside the Mexican government to facilitate collaborative initiatives, including the coordination of regulations and standards and the collaboration on the use of the latest laboratory techniques, as well as information-sharing between both systems and joint workshops on food safety and medical products, said the agency. In addition, certification programs will be developed and technical advice will be provided by way of the FDA staff in Mexico City, said Murray M. Lumpkin, MD, U.S. FDA Deputy Commissioner for International Programs. According to the FDA, the new post will serve as a “portal” to the agency for counterpart Mexican agencies and the U.S.-export industry in Mexico. Other plans for the office include taking part in joint-training for the oversight of food traded internationally, and the safety of food and medical products marketed in the two countries. In addition to the U.S. based-staff, the FDA’s 10 international offices include posts in China, India and Europe. Offices in Latin America include posts in Santiago, Chile, with the agency’s Latin America Office headquartered in San José, Costa Rica. 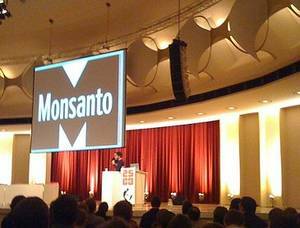 Pity executives at genetically modified seed giant Monsanto. Not only are they having to knock heads with Department of Justice lawyers over the company’s business practices, but some of their most-cherished PR talking points are being obliterated by researchers. We’re also getting a trickle of information that calls into serious question the PR talking point on which the entire GMO seed industry hangs: that GMO products are safe to eat. This is a widely held assumption; but as Don Lotter showed in a recent paper in the International Journal of the Sociology of Food and Agriculture, there has actually been shockingly little research done on the long-term effects of eating GMO foods—and most of what has been was conducted by the industry itself. The problem is that government funding for independent research on GMOs is scant—and industry funding is non-existent. And it’s extremely difficult for independent researchers to get their hands on GMO seeds without signing restrictive contracts with their patent holders, as the New York Times reported earlier this year. The independent research that has been done on the health effects of GMOs paints an alarming picture. Here’s my discussion of the results of a multigenerational study, funded by the Austrian government, that came out last year on the effects of GMO corn on mice. Short story: in the third and forth generations, mice fed GMOs showed “statistically significant” reproductive dysfunction. And now comes this study by three French university researchers. It’s a fascinating piece of work. The researchers analyzed data from tests done on rats by Monsanto and another biotech firm, Covance Laboratories, submitted to European government in 2000 and 2001. The firms conducted the tests to prove that their products were safe to eat; scrutinizing the same data, the researchers arrived at a different conclusion. The three products in question are still quite relevant: one strain of Roundup Ready corn, engineered to withstand Monsanto’s flagship herbicide; and two strands of Bt corn, engineered to contain the insect-killing gene from the BT bacteria. Roundup Ready and Bt products are ubiquitous in the U.S. seed supply, often “stacked” into the same seed. ST. LOUIS — Confidential contracts detailing Monsanto Co.’s business practices reveal how the world’s biggest seed developer is squeezing competitors, controlling smaller seed companies and protecting its dominance over the multibillion-dollar market for genetically altered crops, an Associated Press investigation has found. With Monsanto’s patented genes being inserted into roughly 95 percent of all soybeans and 80 percent of all corn grown in the U.S., the company also is using its wide reach to control the ability of new biotech firms to get wide distribution for their products, according to a review of several Monsanto licensing agreements and dozens of interviews with seed industry participants, agriculture and legal experts. Declining competition in the seed business could lead to price hikes that ripple out to every family’s dinner table. That’s because the corn flakes you had for breakfast, soda you drank at lunch and beef stew you ate for dinner likely were produced from crops grown with Monsanto’s patented genes. Monsanto’s methods are spelled out in a series of confidential commercial licensing agreements obtained by the AP. The contracts, as long as 30 pages, include basic terms for the selling of engineered crops resistant to Monsanto’s Roundup herbicide, along with shorter supplementary agreements that address new Monsanto traits or other contract amendments. The company has used the agreements to spread its technology — giving some 200 smaller companies the right to insert Monsanto’s genes in their separate strains of corn and soybean plants. But, the AP found, access to Monsanto’s genes comes at a cost, and with plenty of strings attached. For example, one contract provision bans independent companies from breeding plants that contain both Monsanto’s genes and the genes of any of its competitors, unless Monsanto gives prior written permission — giving Monsanto the ability to effectively lock out competitors from inserting their patented traits into the vast share of U.S. crops that already contain Monsanto’s genes. Monsanto’s business strategies and licensing agreements are being investigated by the U.S. Department of Justice and at least two state attorneys general, who are trying to determine if the practices violate U.S. antitrust laws. The practices also are at the heart of civil antitrust suits filed against Monsanto by its competitors, including a 2004 suit filed by Syngenta AG that was settled with an agreement and ongoing litigation filed this summer by DuPont in response to a Monsanto lawsuit. The suburban St. Louis-based agricultural giant said it’s done nothing wrong. “We do not believe there is any merit to allegations about our licensing agreement or the terms within,” said Monsanto spokesman Lee Quarles. He said he couldn’t comment on many specific provisions of the agreements because they are confidential and the subject of ongoing litigation. The US Department of Homeland Security (DHS) Secretary Janet Napolitano has announced the creation of the Import Safety Commercial Targeting and Analysis Center (CTAC) – a new US Customs and Border Protection (CBP) facility designed to streamline and enhance federal efforts to address import safety issues. “In addition to guarding against terrorism and crime, securing our borders and facilitating legitimate trade involve ensuring the safety of imported products, this new targeting center will enhance the inspection of goods entering our country by centralizing and strengthening federal efforts to protect US consumers,” explained Secretary Napolitano. The Import Safety CTAC will combine the resources and manpower of CBP and other government agencies – including US Immigration and Customs Enforcement, the Consumer Product Safety Commission, the Food and Drug Administration and the Food Safety Inspection Service – to protect the American public from harm caused by unsafe imported products by improving communication and information-sharing and reducing redundant inspection activities. According to DHS, the new facility, reflects the three core principles announced by President Obama’s Food Safety Working Group in July: prevention, surveillance and response. Created in March 2009, the Working Group was tasked with advising President Obama on how to upgrade the US food safety system for the 21st century. Approximately 30 personnel, representing all of the participating agencies, will work at the CTAC, which will be headed by and located adjacent to CBP’s Office of International Trade in Washington DC. Last week, the Senate Health, Education, Labor, and Pensions (HELP) committee unanimously passed the FDA Food Safety Modernization Act (Senate Bill 510). The bill, originally introduced in the Senate in March, is very similar to a House bill, HR 2749 (the Food Safety Enhancement Act of 2009), which passed the House in July. * Mandatory recalls. The FDA would be granted the power to impose mandatory food recalls in certain situations. * Traceability. The HHS Secretary would be required to develop pilot programs that would seek to enhance the traceability of both raw agricultural commodities and processed foods. * Coordination with other agencies. The bill would encourage the FDA to work closely with state and local agencies to monitor potential food safety and defense issues. The FDA would also be required to work with other federal agencies to develop a national agricultural and food defense strategy. * Regulations concerning high-risk raw agricultural commodities. The FDA, in coordination with the USDA, would develop rules governing certain aspects of the growing, harvesting, sorting, packing and storage of certain high-risk raw agricultural commodities—in effect mandating certain farming, harvesting and packing practices for growers and packers of the affected raw produce types. * Imported foods. One particular focus of the bill is imported foods. Food importers would need to perform risk-based verifications to assure that their suppliers are complying with the new HACCP requirements. The bill would create a new “Voluntary Qualified Importer Program,” which would expedite the review and inspection of foods imported for use by program participants. Importers would also need to provide certifications for imported food shipments, from either an agency of the country origin or other specified international agencies, which indicate the food articles comply with the requirements of the Federal Food, Drug, and Cosmetics Act. The bill outlines the steps for certain foreign agencies and third party auditors to become authorized to perform these inspections and certifications. * Funding. Unlike the House bill, which would fund its activities through fees charged to facilities, this bill would be funded by taxpayers. Additionally, facilities would be required to pay fees to reimburse the FDA for its administrative costs where the FDA needs to reinspect facilities or where the FDA has enforced a mandatory recall. Due to the health care reform and climate change bills pending before Congress, no vote on this bill is expected until at least January. Because this bill does not regulate meat, poultry or eggs under the jurisdiction of the USDA, there is also the possibility that the bill may be combined with other legislation in order to also cover those food items. One such bill was recently introduced by Sen. Kristen Gillibrand (D-NY), entitled the E. Coli Eradication Act of 2009. This bill would require slaughterhouses, processing establishments, and grinding facilities to test trimmings for the presence of E. coli O157:H7 and provide positive or presumptive test results to the USDA. Text of the FDA Food Safety Modernization Act (S 510), the Food Safety Enhancement Act (HR 2749), and the E. Coli Eradication Act of 2009 (S 2792) are available on the Library of Congress Web site at http://thomas.loc.gov/. With food allergies and recalls on the rise, it’s easy to worry about every bite your child takes. Robyn O’Brien was cooking breakfast for her children in January 2006 when she fed her 9-month-old daughter eggs for the first time. An ordinary meal quickly turned into a terrifying ordeal: Tory’s face began to swell and turn bright red before her mother’s eyes. Soon after, Tory was diagnosed with food allergies, and O’Brien grew determined to understand how childhood staples like eggs, peanuts, and milk could have set off allergies in her baby — and in 3 million other kids in this country. Her concerns aren’t unfounded: According to a 2008 report from the Centers for Disease Control, the prevalence of food allergies in children increased 18 percent between 1997 and 2007. Meanwhile, food recalls are more common now than ever before, as evidenced by all the scary headlines about contaminated tomatoes, peanut butter, and pistachios. O’Brien’s investigation into why this might be happening — detailed in her new book, The Unhealthy Truth — convinced her that she needed to reduce her kids’ exposure to potentially harmful chemicals in their food. That’s something we’d all like to do, but how’s a regular mom supposed to play part-time nutritionist? O’Brien spoke to REDBOOK about simple ways we can clean up kids’ diets without losing our perspective — or our minds. How did you even start to tackle all this research, and what did you learn? My background is in motherhood — I have four children between the ages of 4 and 9 — but also in finance. So I began to look into the numbers. I discovered that since the 1990s, this country has been adding genetically modified organisms [GMOs] to its food supply. That means some of our food has had foreign proteins inserted into it, for many different reasons. For the past 15 years, for instance, much of our milk has come from cows injected with a hormone called rBGH to increase their milk production. And 80 percent of our corn now contains an insecticide so we lose less crop to pests. I wonder whether a child with allergies might be reacting to those foreign proteins. As I learned in business school, correlation is not necessarily causation: We can’t know that food allergies are caused by GMOs just because they both rose at the same time. There’s a strong enough correlation, however, that I feel it merits investigation. You mention a study in which 300 kids in England were put on a diet free of artificial coloring, sweeteners, and preservatives. Half were given a drink made of artificial colors and a preservative; the other half got a placebo drink. In the end, kids who got the first drink were far more hyperactive. What was the result? After this study, there was a follow-up confirming it a few years later. The follow-up was so compelling that corporations in the U.K., including Kraft and Coca-Cola, said, “We’re going to voluntarily remove these chemicals from children’s products.” It gave me hope, because it means corporations are responding to the needs of mothers overseas. And once we’re informed the way the mothers in the U.K. were informed, then companies can bring those same products here to the United States if we want them. Creating a chemical-free diet sounds time-consuming — and pricey. I can totally relate. All I have time to do is stick chicken nuggets in the microwave and hit two-zero-zero-start. But I made really simple changes in super slow motion. I used to buy multicolored goldfish from Costco, so I thought, I’m just going to buy the ones that are all gold. That way, at least I’ve dumped the multicolored chemicals out. Once we got to gold, then we got to the plain ones, then switched to pretzels. It takes who knows how long to wean a kid off a sippy cup or to potty-train, and that’s how I approached it — it wasn’t going to be overnight. So starting with just one change can make a big difference? Yeah, that was critical. If I had to do one thing, what would it be? My boys were milk guzzlers. So I thought, I’m going to buy milk that’s rBGH-free. It’s available in Wal-Mart, Safeway, Kroger. It’s really, how do you reduce the load of chemicals your kids are getting? You can’t go cold-turkey. These are kids, and I live in the real world, where kids are picky eaters. But if cutting back on chemicals meant my boys got an extra 15 minutes of sleep each night because they settled down earlier, I was gonna try it. Those 15 minutes — that’s a gift! What overall changes need to be made in this country to ensure that our food supply is safe? 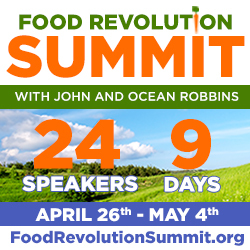 Our food system is in dire shape. In 2007, the FDA stated that it is woefully underfunded and that “American lives are at risk.” They don’t have the money they need to investigate and protect us from potential toxins in the food supply. 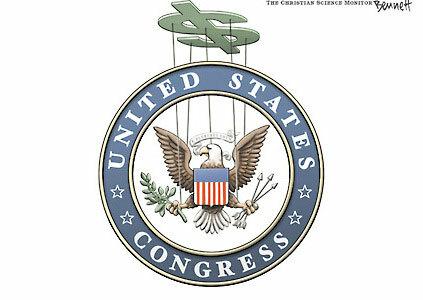 If we can bail out the banking system, then we need to prioritize funding the FDA. But to me, the most important thing is to believe in yourself and your ability to effect remarkable change for your family. We moms have incredible abilities, collectively. And we cannot be daunted. If the moms in other countries have spoken up and gotten corporations to make changes, we can too. 1. Fresh bread with tomato sauce for dipping, an rBGH-free cheese stick or string cheese, and applesauce. 2. Salami, a piece of fresh bread, carrots, and leftover dinner noodles with olive oil or grated cheese. 3. PB&J on fresh bread, color-free potato chips, and a smoothie. 4. An English muffin topped with tomato sauce, rBGH-free cheese, and deli meat, veggies, or whatever you can get away with. Then sandwich the “pizza pie” with the other half of the English muffin. Add a piece of fruit for dessert. 5. Rice and beans — add a side of salsa or guacamole to stir in, and a piece of fruit. Craig King eventually hopes to use the film to take food awareness beyond the walls of natural foods stores and the stalls of farmers’ markets to poorer neighborhoods where a fresh fruit or vegetable is as rare as a well-paying job. 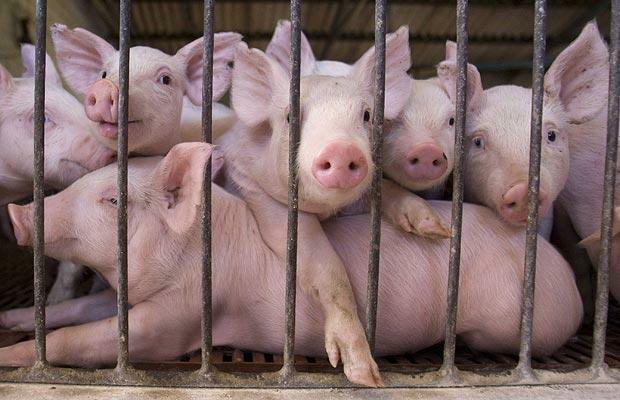 Why isn’t the federal government seriously investigating the possible CAFO-swine flu link? I’ve posed that question several times recently, most recently here. Now let me venture an answer. The USDA is the federal agency tasked with ensuring that practices on farms, including factory animal farms, are safe. But it’s also the agency that exists to promote U.S. agricultural interests. In other words, the USDA has an inherent conflict around overseeing conditions on factory-style farms. For example, training a cold eye on the systemic safety hazards of factory farming isn’t likely to do much to promote the pork industry. from the start of the novel H1N1 outbreak, the USDA has tilted decidedly in the direction of promoting U.S. ag interests. Even though virologists and veterinary scientists have been warning for years that large hog farms create ideal conditions for the generation of dangerous new flu viruses—as this Environmental Health Perspectives article definitively shows—-the USDA still isn’t systematically testing swine herds for H1N1. It continues to rely on a voluntary—and little used—testing program. Nor is it doing much, from what I can tell, on the problem of MRSA, the antibiotic-resistent staph infection that claims more lives every year than AIDS. MRSA has been pretty definitively linked to factory hog farms—specifically the dubious practice of dosing pigs daily with antibiotics. If the USDA has been limp in its attempts to examine safety conditions on factory farms, it’s been downright zealous in its efforts to promote the pork industry. The latest: The USDA spent a cool $50 million on pork last week, in an explicit attempt to “assist … struggling producers.” That brings total 2009 federal spending on pork—the “other white meat,” that is, not pet projects for cronies—to $105 million. The latest $50 million worth of pork will be shunted into the National School Lunch Program, playing its traditional role of sinkhole for unwanted ag commodities. This Wednesday, November 18th, the U.S. Senate plans to consider a massive “food safety” bill entitled “The FDA Food Safety Modernization Act”. This bill (S. 510) will strengthen the forces that for the past fifty years have led to unsafe, nutritionally compromised food and will undermine growing efforts working to thwart those forces. (To read the bill and view co-sponsors, go to www.thomas.loc.gov and enter “Food Safety Modernization Act” in the search field). U.S. Supreme Court Justice Louis Brandeis said, “Experience should teach us to be most on our guard to protect liberty when the government’s purposes are beneficial“. The Senate’s food safety initiative, though intended to be beneficial, follows the House version by leading food down the Food and Drug Administration (FDA) “modernization” path that Congress designed for drugs. (This House version, H.R. 2749, has the same drawbacks and originally failed; later in the same week it was passed under different rules). Click here to send a letter to your Senators urging them to amend or oppose S. 510! The FDA’s drug modernization approach places high-cost drugs at the heart of a dangerously costly health system, contributes to thousands of drug-related deaths, and leads to the approval of many unsafe drugs that end up being recalled. It also makes FDA drug regulation perilously dependent on the financial support the agency receives from drug company fees. S. 510 – in keeping with this flawed drug modernization path – gives powerful incentives to large, concentrated food manufacturers (the sources of the most significant threats to our food so far) while undercutting producers that are smaller, safer, and often local. Today Citizens for Health launches its food safety campaign and our first goal is to amend or defeat S 510. If the bill passes without any meaningful, substantive changes, we will seek a Presidential Veto. If the bill that is finally signed fails to address our concerns sufficiently we will work to establish and implement regulations to minimize the negative impact on food safety that will surely result, and we will redouble our efforts to maximize the food choices and food and health information available to all. And, remember: we are not opposing food safety. We are working to advance it by opposing misguided attempts to build a flawed, drug-like bureaucratic structure on top of a crumbling food safety foundation that desperately needs to be shored up and repaired. We need your help to win – click here and send your letter to your Senators now! During this process we will regularly address key food safety issues and the food safety decisions we make – as a nation and as individuals – that shape our lives. It is essential that we all have the opportunity to understand how these issues and decisions affect our ability to trust our food supply. In a very real sense we, as a nation, are what we eat. We welcome a robust discourse – here at Citizens.org, in your community, and in policy. And, ultimately, we all look forward to safer, healthier, more trustworthy food. On a final note, consider this remark by Mark Twain: “No man’s life, liberty or property are safe while the legislature is in session.” Now is the time to act to minimize the damage that will result from passage of S. 510. I thank you for staying involved in this discourse and look forward to hearing from you. Take a moment to share your comments at blogcomments@citizens.org, and don’t forget to click here now to send a letter to your Senators urging them to oppose or overhaul S. 510.